There are multiple ways to review images from current and past exams on the Philips CX50. This free training video shows the various techniques for viewing images and comparing images from a current or past exam. It also covers viewing reports. This is one among many of our videos in our free Ultrasound Machine Hands-On Training Library. Looking to buy a Philips Ultrasound Machine? Call one of our sales experts today at (877) 661-8224. 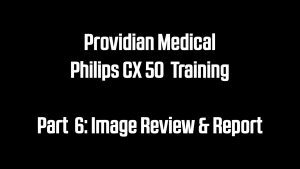 Links to all 9 parts of our Free Philips CX50 ultrasound training series can be found below the video. Looking to service, buy, or sell a Philips CX50 Ultrasound? Contact us today at 877-661-8224.